Cambodia has some of the most beautiful places in the wold. 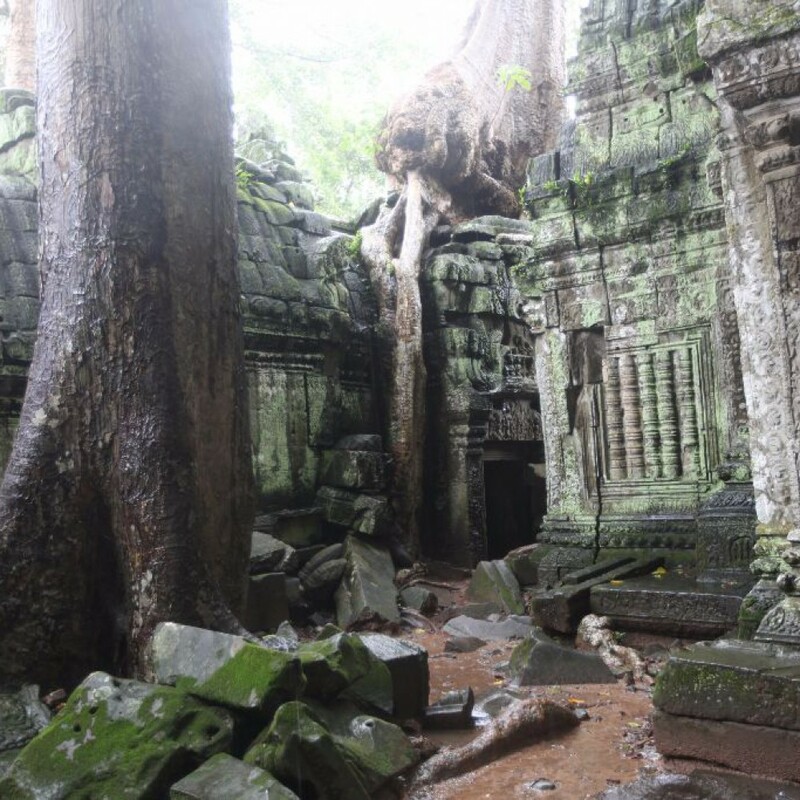 And Siem Reap is probably one of our favorite places in Cambodia. The atmosphere is relaxed, people are friendly, there are lots of good food and a huge selection of fresh food at the market. And there is Angkor Wat. You might recognize it from the Indiana Jones movie or maybe Tomb Raider. We went there no a three day pass, which cost us around 40 USD, and had the time of our lives there. One of these days we managed to walk a bit far from the main temples, trying to reach the next compound of temples. There was a big stone Buddha on a giant, ancient stone Kazeebo hidden away among the trees. We had to check it out. When we got closer we saw Nuns sitting in the Kazeebo and they greeted us and asked us to come in. The language barriers were huge but we managed. They sit under the Kazeebo during the days with their Orphans that are under their care and bless locals and others. In Cambodia the population is mainly Buddhist. And when children are born a monk tie a red string, braided or non braided, on the childs wrist and bless it with health for the child and for its family. Later this string can only be removed or replaced by a monk or a nun. Usually when the child grows out of it or when he or she marries. The string is then replaced with a new one to bless them in the new life the couple are starting together. We sat with the nuns for a while and after a few minutes we too got strings and got blessed. It felt like an honor too be able to be blessed and since we can’t really carry around souvenirs these bracelets would be our souvenirs forever. One of mine came off recently and I came to think back of our day when we met the nuns in Angkor Wat. The setting, the friendly nuns and the charming people in the Kazeebo really made the Angkor experience unforgettable to us.